Green Toe Ground will host five formal dinners a year at the farm, attracting apx. 40 people to each event from places as far away as Charlotte. 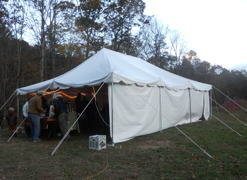 Purchases include a pole tent, chairs and promotional materials. The dinners add to their income and increase customer satisfaction and farm notoriety. They are also great opportunities to educate consumers about farming. See www.localharvest.org/green-toe-ground-farm-M7524 or Green Toe Ground’s Facebook page.